1. They've launched the Ilonggo Family Fiesta favorites - It is the right time to launch the Ilonggo Family Fiesta Favorites given more and more Ilonggos are looking for alternatives on where to eat and dine together with their families for special get togethers or celebrations. May is also the Fiesta Season so Kamalig made the selection available to families who may be looking for them. 5.With 2 two branches in Iloilo City - Atria and Robinson’s Place Jaro. Families can order from Ang Kamalig for take home, or ask them to cater in their houses for special occasions. 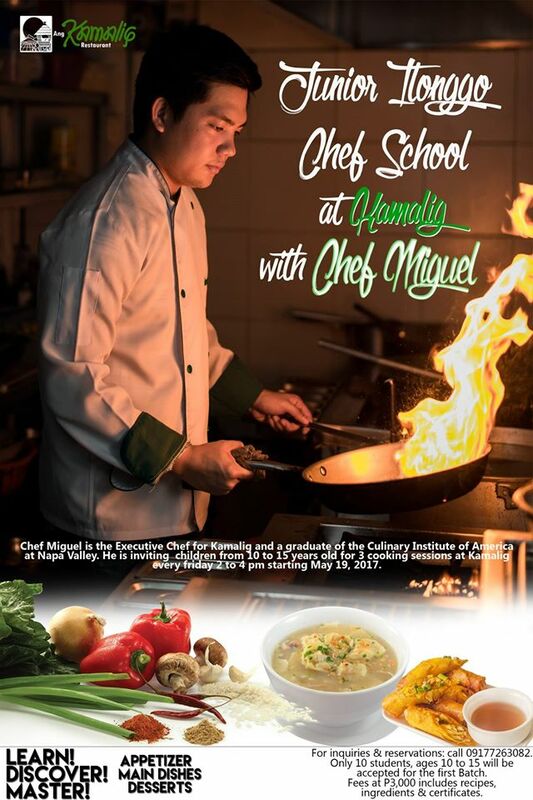 Chef Miguel will also be offering a Junior Ilonggo Chef school to 10 students only starting May 19 and children ages 10 to 15 are welcome to register for P3000.00. They will have three sessions to learn about native Ilonggo fare – Ilonggo favorite appetizers, main meals, and desserts. Chef Miguel will be their teacher every Friday from 2pm to 4pm, and for sure, kids will look forward to eating and learning at the same time. Ilonggo food is so unique, Chef Miguel wants to continue the tradition in teaching the basics to the kids so Ilonggo culture and traditions can continue.